By agreeing to be a group leader, you have taken on the critical task of shepherding a portion of the congregation. With prayer and proper preparation, your group will be an environment where community and discipleship coexist. Here are a few things you will need to do to help ensure the successful launch of the group in January. This could be a room at the church, someone’s home, a community clubhouse, or anywhere that people can meet for one to three hours each week. Ensure it is centrally located for people in the group, and can comfortably host eight to 16 people. If your group will have families with young children, make sure the facility has enough rooms for adults and kids during the group discussion time. The day and time will help determine who will be able to attend. If it is on Sunday morning, the group will be limited to current church attenders. If it is held during the day on a weekday, it will be limited to people with flexible work schedules. If it is later in the evening, it may be difficult for young families to attend. Think through who you want to invite to the group, and plan a schedule that fits their needs the best. Start with the people who are in your immediate circles–friends, family and co-workers. Make a list and then personally invite each one. Here are 10 questions that a potential group member may ask. 1. How much time is this going to take? 2. What are we going to do with our children during group meetings? 3. Will there be homework? If so, how much? 4. Am I going to have to talk or can I just sit and listen during meetings? 5. Will I have to pray out loud? 6. Who else is going to be in the group? 7. How much do I have to know about the Bible? 8. How many weeks or months is the group going to last? 9. If I don’t like it, can I leave without people being angry with me? 10. What are we going to do during the meetings? Choose a launch date that will allow your group to meet for several weeks before a possible interruption. The second or third week of January is an ideal time to launch a new group. People are back from vacations and holidays and getting back into a weekly schedule. This year, you will have a 10-week stretch to Easter Sunday with no major interruptions. 1. What is your biggest fear in starting a small group? 2. What type of location would work best for your small group? 3. Who will you invite first to your group? 4. Which potential questions from invited group members will be the most difficult to answer? Chris Surratt is a ministry consultant and coach with over 22 years of experience serving the local church. Chris served on the Executive Team at Cross Point Church in Nashville, TN, and was on staff at Seacoast Church in Charleston, SC, for 15 years. He is also the Small Group Specialist for LifeWay Christian Resources. Chris’s first book, Small Groups For The Rest Of Us: How to Design Your Small Groups System to Reach the Fringes, was recently released by Thomas Nelson. You can follow his blog at chrissurratt.com or follow him on Twitter @chrissurratt. While it is extremely important for the senior pastor to be an advocate for groups in the church, there may be some work to do to get him there. A church without the pastor as the champion for groups will typically max out at around 40 percent who connect in groups. There are a few things you can do to win him over and reach the other 60 percent and beyond. There is no senior pastor who does not get fired up about hearing stories of life change taking place in the church. Send him a monthly email update. Slip them into all-staff meetings. Include him on updates to leaders. If there is a constant flow of life change stories from the groups team, he will begin to embrace the concept. Show him how key initiatives in the church can be reinforced through small groups. If there is a building campaign, design a study around it for groups to go through. Or write studies to go along with the weekly messages. Every pastor loves to hear his members still talking about the Sunday message on Wednesday. Allow him to participate in a small group with handpicked members. Senior pastors feel the pressure to have to lead everything in which they are involved. Give him the opportunity to feel invested in a group he does not lead. The members of the group should be non-EGR’s (extra grace required) people, with whom he can be comfortable on a weekly basis. Invite the senior pastor to speak at the next leadership training event. There is something exhilarating about a roomful of leaders going in the same direction. By participating in the training, he will begin to see the leadership development potential of a well-designed small group system. Don’t forget to fill the night with stories of life change. 1. You take the summer off. 2. Your groups meet year-round but experience a drop in attendance in the summer. Either way, Fall arrives with a return to school and regular schedules, so it’s a great time for people to get involved in a group. They’re making adjustments back into a routine and are more likely to jump into a group. This also means it’s a great time to launch new groups and promote the groups you’ve already got. But how do we get people connected and involved in a Bible study? Getting people plugged into a group involves a little more than a generic “Ya’ll come” announcement from the pulpit and in the church newsletter. To promote Bible study groups, you need to give people three things. 1. Give them information. Think like someone who has never been in a small group or Sunday School. He has no idea what happens. Is it a lecture? Will I be expected to talk? Is this some kind of support group where I’ll have to share my feelings? How much of the Bible do I need to know? • Create a brochure describing the groups. Include information about where they meet, what they study, and the general makeup of the group (young families, primarily empty nesters, and so forth.) If your groups meet at the church, include a map. Don’t assume if you say “We meet in the fellowship hall,” visitors know where the fellowship hall is. I attend a smaller church with five Life Groups for adults. My brochure includes a map so no guesswork is involved for finding a group. Give everyone a brochure. • Use social media to talk up classes. On the church’s website, ensure that promotion of groups is front and center. Don’t bury your groups under a pull-down window alongside thirteen other ministries or programs. 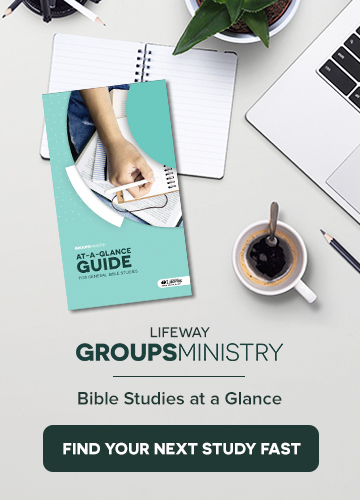 Bible study groups are foundational to the life and ministry of the church, so give them prominence. 2. Give them a reason. Create a hunger in people’s lives for being in a group. Lead them to see why they need to be in a group. • Highlight the value of community. My pastor periodically talks about the value of community. Use the worship service as a time to underscore the need for discipleship and connection with other believers around God’s Word. • Testimonies. Enlist people to give a two- to three-minute testimony on how involvement in a Bible study group has benefitted their walk with Christ. This can be done as a part of the service or as a pre-recorded video shown before the service begins. The beauty of a video is you can also post it on the church’s website and social media page. • Videos. Many Bible study resources include video, Show a snippet or use the promo video provided. For example, Bible Studies for Life offers a 60-second promo video for each of its six-week studies (http://blog.lifeway.com/biblestudiesforlife/category/videos). 3. Give them a connection. This is the most important thing to give them! The key factor in people getting involved in a group is the fact they received a personal invitation. They know someone in the group who wants them to come. • Instill in both the group leaders and group members a lifestyle of invitation. Lead them to keep their eye out for people who visit the church, meet them, and extend a personal invitation. • Lead group members to create a list of names—family, friends, neighbors, work colleagues, connections in a hobby, and Facebook friends—and invite them. It’s as simple as that! Guests are more likely to attend a small group when someone they know invites them. Remember those brochures I mentioned earlier? Give a stack to everyone, and as they invite others, they can hand the brochure to them. Lives change when people get plugged in with a group of believers who study Scripture together and encourage one another. And it all begins with an invitation.